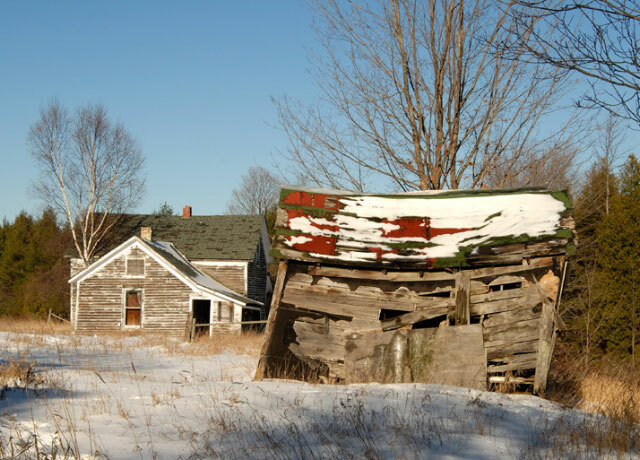 the old Burke Farm, or as they call it, the Egbert Farm. It's a short hike, although you have to go in from East Side Drive. 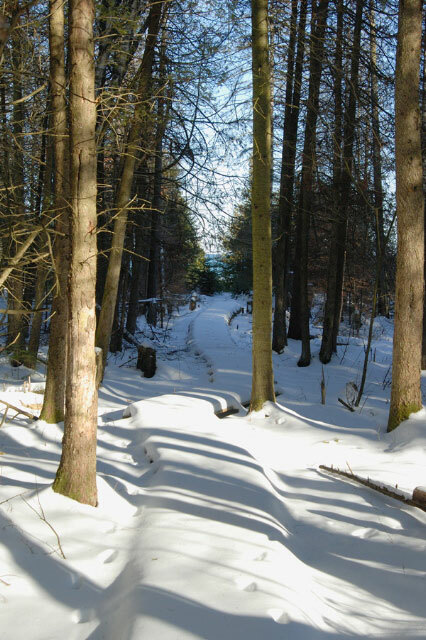 Here's the snow-covered boardwalk down to the beach at Little Sand Bay. 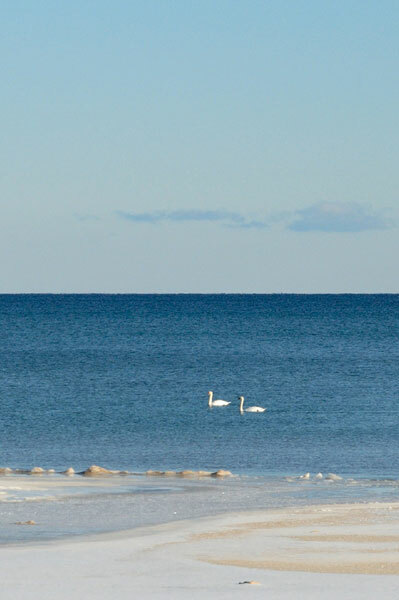 As you can see, it was a sunny 'bluebird' day. The new boardwalk is plenty wide enough for my big snowshoes and even hiking in from East Side Dr.
A couple out for a swim. Parents, Students and Community Members are Welcome. December 13th is the Cookie Carnival at the BI Christian Church. The AMVETS and Ladies Auxiliary will again host a Santa's Workshop at the Beaver Island Community School on Thursday, December 13th. Remember that the BI Boat Company's Emerald Isle will make its last trip on December 14th with the Beaver Islander finishing out the season. The Emerald Isle Motel and the AMVETS and Ladies Auxiliary of Post #46 will again partner in the Annual Children's Christmas Party to be held on Saturday, December 15, 11:00 – 1:00 at the Emerald Isle Motel. Remember December 16th is the last day to contribute to the Ellen Welke Memorial Toy Drive. Call Connie Boyle for more information, 448-2491. Beaver Island Community School will hold its Holiday Program at 7 p.m. at the Holy Cross Hall on December 18th. A December 31st New Year's Dance will held at Holy Cross Hall from 7:30-? with Cindy Cushman, Dan Gillespie, John McCafferty, Ed Palmer and Brian Roman providing entertainment from 7:30-9:30 and the Doghouse Boodlers performing from 9:30-closing with guest performers?? joining in. There will be a buffet at midnight and 50/50 raffles as well. Come join in the fun! Friday, December 21 st , the Doghouse Boodlers will perform in the Pub. Special, ALL YOU CAN EAT, Dinner Buffet from 6-10 pm includes Prime Rib, Roast Pork Loin, Roast Turkey, Never Ending Shrimp, Whole Baked and Chilled Atlantic Salmon, and Lots of other side dishes including salads breads, desserts, and stuff for the kids as well. $17.95 for adults, $8.95 for twelve and under, and under four years old is free. Donegal Danny's Pub will close after the dinner hour to help support the New Year's Eve party scheduled at Holy Cross Hall. Please go and support the traditional party at the hall. On New Year's Day, please join in at Donegal Danny's Pub for football, munchies, and Happy Hour all day long. Island Treasures Resale Shop will continue our Monday/Tuesday schedule until the holidays. Hours are noon until 4:00PM. We will also open on Saturday, Dec. 15 for holiday shoppers. The shop will be closed during the weeks of Christmas and New Years. This rates a page all to itself. What a wonderful performance it was!! Here is a convenient link to the 2008 Membership form. http://www.beaverisland.org /2008-membership/index.html Also included is a brief summary of how your dues are spent. Save your Chamber some postage. The deadline is December 30. If you haven't sent in your renewal please do it today. Only three sponsorships for the July 19 air show remain. Each $700 sponsorship includes a ride ($425 value) in the Yankee Lady. She is the best restored example of a flying B-17 bomber in the world. Contact your Chamber office for details. 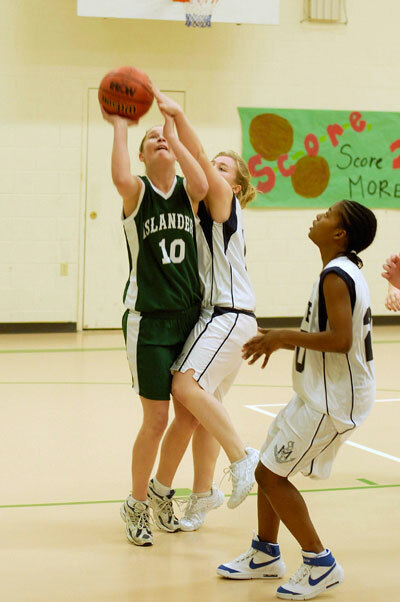 There was no mistaking which was the better team on the basketball court during the Lady Islanders season-opening home series against the rival Lakers of Mackinac Island, Nov. 30-Dec. 1. 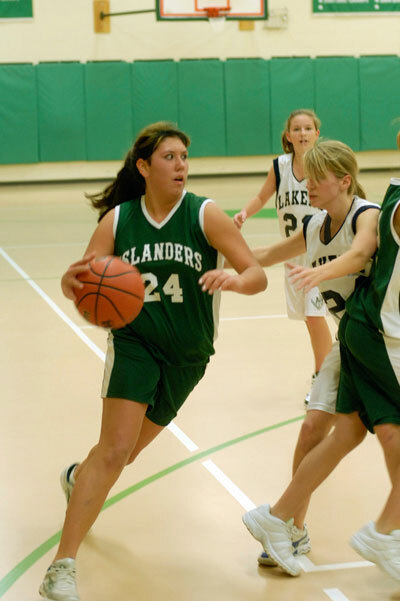 The Lady Islanders swept their way to a pair of victories, sinking the Lakers 34-24 on Friday night and then 32-25 on Saturday morning. In both games the Islanders took the early lead and never looked back. 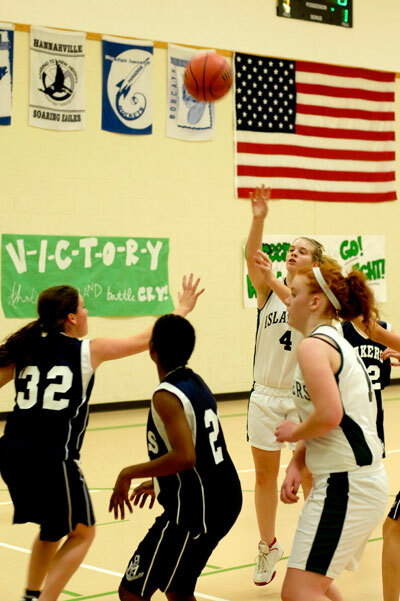 Junior Maeve Green got things going Friday, grabbing the opening tip directed her way by the Islanders towering six-foot junior center Heather McDonough, drove down the court and made good on the team's first historic shot. McDonough netted the next three buckets and the Islanders were well in command with an 8-0 lead after the opening quarter. The Lakers battled back in the second quarter, twice drawing within two points. But a 6-0 Islanders run to close the half pushed the lead back to eight, 20-12, at the break. Freshman forward Clairessa Kenwabikise showed a strong presence inside, scoring six of the Islanders points in the period. Another 6-0 run to open the third quarter put the Ladies up 26-12. Junior Briana Maudrie came off the bench to snare a number of steals to increase the already intense Islanders defensive effort. The Islanders were comfortably ahead heading into the final eight minutes, 28-19. The tempo of the game slowed over the final frame, with senior Samantha Kuligoski scoring twice inside and Green going up after an offensive rebound to account for the Islanders final six points. McDonough led the Islanders scoring attack with 10 points. Green finished with eight, Kenwabikise six, Kuligoski and Maudrie with four each, and sophomore Alex Kuligoski with two. Knowing her team had a big edge in ability, coach Marianne Brown was more liberal with her bench on Saturday, making sure all 14 of her charges saw some floor time. Again the Islanders jumped ahead early as again Green grabbed the opening tip and drove for a score. Before the first minute of play was over the Islanders had a 6-0 lead and the rout was on. Maudrie scored after a steal and Samantha Kuligoski added a pair of inside scores as the Islanders held an 8-2 lead at quarter's end. 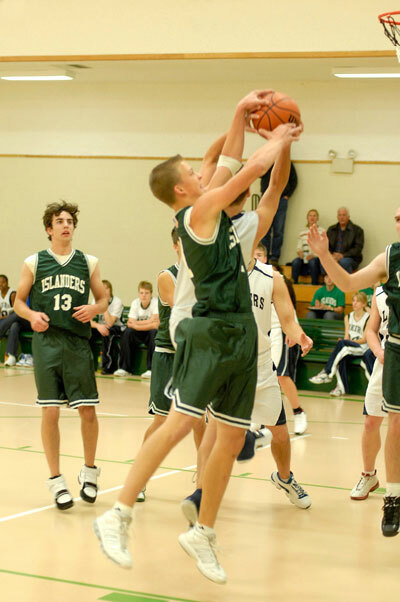 The Islanders nearly repeated Friday's opening quarter shutout of the Lakers in the second stanza, building a 16-2 lead before Mackinac managed a late basket with 34 seconds left in the half. Still, the Islanders had a huge 16-4 advantage at intermission. Both teams played a strong third quarter, combining for a 50 percent shooting effort. The Islanders proved a tad stronger, hitting for 10 points to the Lakers nine, giving themselves a 26-13 lead with eight minutes to play. 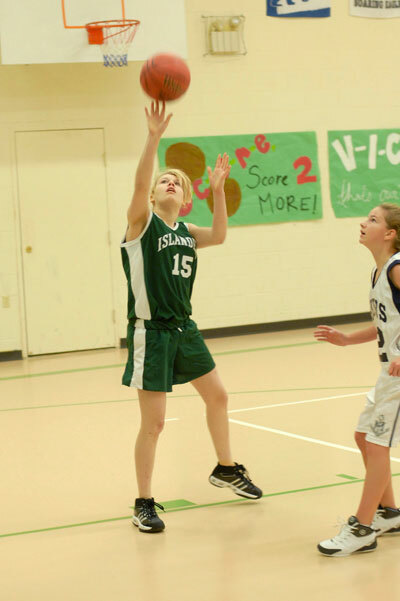 The highlight of the quarter came in the final minute when Islanders eighth-grader Jenna Battle drove the right side of the court, pulled up eight feet out, and sank the first shot of what can only be expected to be an impressive varsity career. The Lakers were able to keep the pressure up against the Islanders bench during the final frame, pouring in a dozen points, but never getting closer than the final seven-point margin. 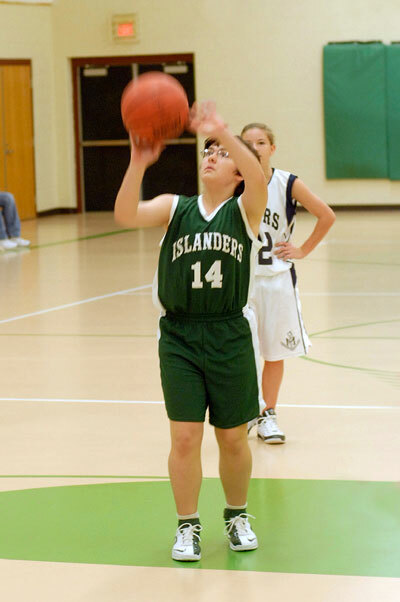 The Islanders showed terrific scoring balance as Maudrie and the Kuligoski sisters each netted eight points. Green finished with four, while Kenwabikise and Battle added two apiece. And if this series was any indication, it's a bright future to be sure. The Islandes travel to Ojibwe Dec. 14-15 for the final series before the holiday break. It certainly was a tale of two games when the Mackinac Island Lakers visited here for a pair of season-opening basketball games over the weekend of Nov. 30-Dec. 1. The Lakers ran away from the Islanders in the Friday night contest, shooting over 50 percent from the floor, in a decisive 63-37 win. And just when Saturday morning's game looked to take a similar turn, the Islanders poured on the defensive pressure, fought back from a 10-point deficit to briefly take a late, one-point lead, the Lakers found a way to claim a hard-fought 50-49 win. Saturday's game was a better showcase of Islanders talent than the flat performance the boys gave on Friday night. They stayed with the tall, talented Lakers for most of the game until a third-quarter barrage of three-pointers lifter the Lakers to a 12-point lead midway through the period. But with no give in their gut, the Islanders fought back. 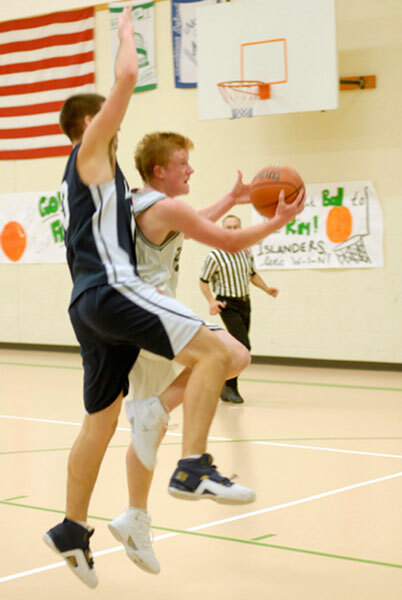 A late driving basket by senior Eric Albin closed the gap to 43-32 heading into the final quarter. Then the Islanders not only switched to a 2-3 zone defense, they played it like Jim Boeheim's Syracuse team that won the 2003 NCAA title with that much-maligned and often-overlooked setup. Denying the Lakers time after time at the offensive end, the Islanders clawed their way back into contention. Triples by Albin and sophomore Bryan Timsak keyed the locals effort. 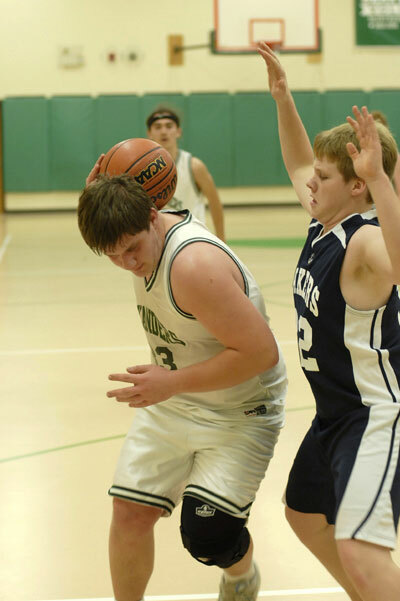 When senior Brenden Martin scored on a pull-up jumper with 41 seconds to play, the Islanders were suddenly within a point of the Lakers, 46-45. After the Lakers scored their final field goal to push the lead to 48-45 with 32 second left, the Islanders worked the ball until Timsak was fouled and sent to the line for two shots with nine seconds remaining. Despite the team struggling from the line throughout the weekend, Timsak calmly sank both attempts, again bringing the Islanders within one, 48-47. On the ensuing inbounds play the Lakers threw the ball long and high — high enough to hit the ceiling. After some discussion, the refs ruled the ball out of bounds, giving the Islanders a final chance. 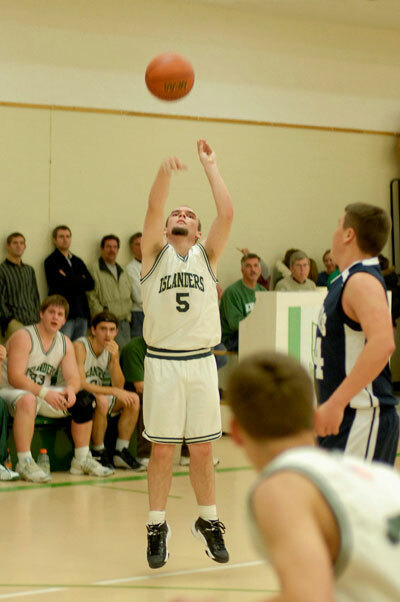 An inbounds throw and a quick pass brought the ball to junior Patrick Cull on the right side of the basket where he connected with just four ticks on the clock, giving the Islanders a 49-48 edge. Following the Lakers inbounds, junior Michael Gamble (who hurt the Islanders three seasons ago as a long-range eighth-grader) was trapped and fouled. Showing great fortitude with the game on the line and zeroes on the clock, Gamble sank both ends of his one-and-one attempt for the win. Cull led the Islanders with 16 points, including four treys. Albin chipped in nine, while Martin, Timsak, and senior Dan Runberg each scored four. There was no what ifs about the Friday game, however. The Lakers grabbed a 14-6 lead after the first quarter and extended that to 33-14 by halftime behind a 14-4 run that closed out the second quarter. The Lakers added two to their lead through the third quarter and outscored the Islanders 19-14 over the fourth. Although the Islanders out rebounded the Lakers 37-32 and committed fewer turnovers (19-15), they shot a dismal 25 percent from the floor, compared to a strong 51 percent by the Lakers. Each team connected for five three-pointers, but it took the Islanders 18 attempts to do so while the Lakers did it in just eight. It was that kind of night. “We didn't play our game,” Martell said afterwards. “We didn't run our plays and we got frustrated. 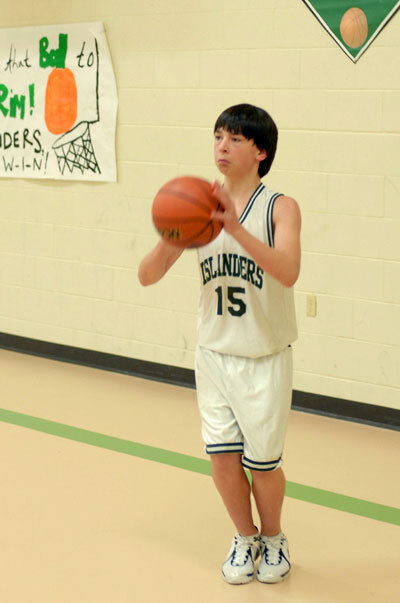 Albin led the Islanders with 23 points. Timsak added 10 while Martin and Cull each put up six. Runberg had four. The Islanders hope to play their game during their next weekend series Dec. 14-15 at Ojibwe before heading into the holiday break. Peaine Township Minutes will also be posted when received. School Board minutes will also be posted when received. Can you name the last two Dominican Sisters who taught on Beaver Island? Two correct responses came in quickly, from Sally Lounsbury and Becky Gerace, but Becky's was the first one received in the email. The last two nuns who taught on Beaver Island were Sister Marie Eugene and Sister Mary Rock. Both of the first two lay teachers to work with the Dominicans were male. 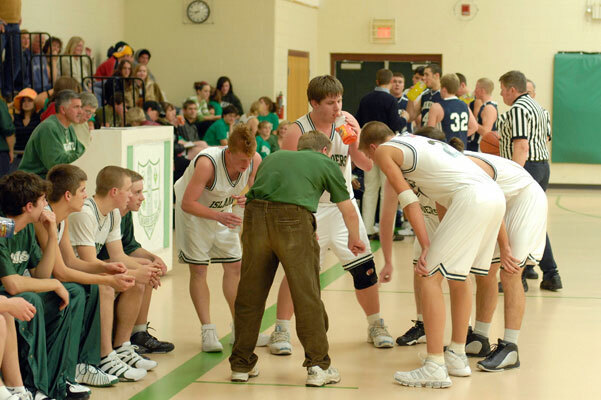 Can you name the first two male lay teachers to teach at the current school building? The first correct answer will earn a gift subscription to News on the 'Net for the months of, December, January, and February for the person of your choice. Email your answers to medic5740@gmail.com.